The Cookstown 100 will be the first Irish National road race in 2018. The Cookstown 100 will kick-start the Irish National road racing season next year following confirmation of the 2018 schedule at the MCUI Inter Centre Conference over the weekend. The Co Tyrone event, held on the 2.1-mile Orritor course, will take place from April 27-28, while the North Armagh Club’s Tandragee 100 meeting reverts to its traditional slot a week later from May 4-5 prior to the international North West 200 (May 15-19). A total of four National races will be held in Northern Ireland, with the addition of the new Enniskillen event added to the calendar on June 29-30, while the Armoy ‘Race of Legends’ is pencilled in during the final weekend in July. However, the Mid Antrim 150 – last held in 2016 – will not take place for the second year running. The news was confirmed at the club’s recent Annual General Meeting and the decision was largely expected after poor weather blighted the event last year, resulting in a negative impact on anticipated profits. It is hoped that the race will go ahead in 2019. John Burrows, who runs the Cookstown B.E. Racing team, said the news was ‘massively disappointing’ for the Mid Antrim Club. 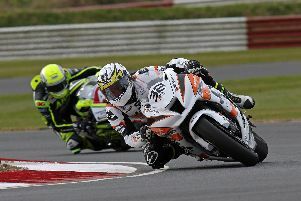 Former racer Burrows has been a big supporter of the meeting over the years and entered his team at the event in 2016, when English rider Malachi Mitchell-Thomas burst onto the scene, chalking up a treble with wins in both Supersport races and the Open Superbike race as he made his debut between the hedges. On a terrific day for the Dungannon team, Derek Sheils claimed victory in the feature Superbike race and Burrows hopes the opportunity will arise to return to the Clough meeting in the future. “It’s massively disappointing for the Mid Antrim Club because they put such a big effort into the event in 2016 to get it up and running again,” he said. “They didn’t get the weather or the support that they deserved on the day and for everyone involved to pull the race back around and then lose it again is disappointing, and disappointing for road racing in general. “Hopefully in the future they can turn it around because we had a great day in 2016 as a team and I’d love the chance to go back and support it again,” added Burrows. “If we had the Mid Antrim up running again and then this new race in Fermanagh, then we’d have five rounds for the Ulster Championship and it would be a much better situation for National road racing in Northern Ireland. After sitting out this year, the Kells Club is pressing ahead with plans to run its race next season at the end of June, while the Skerries 100, Walderstown and Faugheen meetings will all take place during a busy July along with Armoy. The Ulster Grand Prix at Dundrod will be the final road race in Northern Ireland (August 7-11), with the East Coast Festival at Killalane scheduled to bring the curtain down on September 8-9.